CEBU CITY -- Help continued to arrive for earthquake survivors in Bohol and Cebu, as Davao City Mayor Rodrigo Duterte visited on Monday with a total of P18 million in checks for both provinces. In Cebu, Archbishop Jose Palma and officials from the police and government’s earthquake monitoring agency warned against circulating false text messages and social media posts about a stronger quake ahead. At 8:12 a.m. exactly one week ago, an earthquake with a magnitude of 7.2 struck parts of the Visayas, with Bohol bearing the worst of the damage. 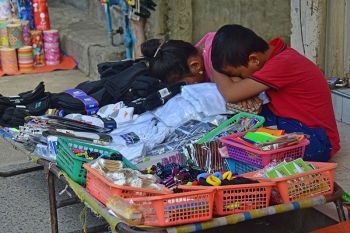 Government offices and nearly all businesses in Cebu were near-normal Monday, but classes will remain suspended until November 4. At least 189 were confirmed dead as of 6 last night by the Office of Civil Defense (OCD) in Central Visayas. Eleven people in Bohol remain missing, at least five of them minors. Mayor Duterte of Davao visited Cebu Gov. Hilario Davide III to hand over P5 million for Cebu and P13 million for Bohol. Various private organizations have gathered cash and relief goods and continue to do so. In a benefit concert last Sunday in Cebu City’s Ayala Terraces, business and civic groups and performers raised at least P1 million cash for relief operations. The Department of Social Welfare and Development (DSWD) 7 said at least 45,763 houses in Cebu and Bohol were damaged by the tremor, nearly 45,000 of them in Bohol. During the mass in honor of the feast day of St. Pedro Calungsod on Monday, Archbishop Palma encouraged those affected by the earthquake to keep the faith. “Our faith tells us, in moments like this, to cling to God,” he said. He also warned against circulating a false text and social media message about an 8.0 magnitude that was supposed to hit Cebu. There remains no way to predict quakes. “For those who are creating or making hoax messages, it’s sad enough that these things happen but why do they have to create fear? This is an uncharitable act. Nahadlok na gani ang tawo, imu pang dungagan (The people are already afraid; why make things worse? ),” he told reporters yesterday. In Cebu City, the Philippine Institute of Volcanology and Seismology (Phivolcs) also appealed to the public to stop spreading and not to believe the hoax messages. Jeffrey Perez, supervising science research specialist of Phivolcs, emphasized the message did not come from Phivolcs. “So kung kayo po ay nakatanggap ng texts or message na iyan sa social networking sites, hindi po totoo yan. Klaro po yan. So sana wag nang i-propagate (If you receive those messages, rest assured that those are not true. I hope it doesn’t spread further),” he added. Speaking before hundreds of Cebu City Hall employees during the flag-raising ceremony Monday, Perez assured that the aftershocks are a normal part of an earthquake, and that these are expected for two to three weeks after the main quake. He advised people to remove hazards that may fall on them in homes and workplaces. “Ang lindol hindi nakakamatay. 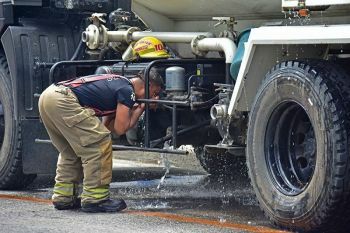 Ang nakakamatay ay yung mga nagbabagsakang bagay (Earthquakes don’t kill; it’s falling objects that are fatal),” he said. The police plan to press charges against those people responsible for spreading hoax messages about a quake. 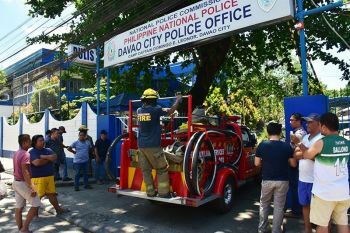 Central Visayas Police Regional Office (PRO) Director Danilo Constantino said on Monday they are investigating who made the text message that circulated after strong aftershocks struck Bohol and Cebu last Sunday. “They could be held liable for disseminating false information and for causing public disorder,” the police official said in a press conference. The television network to which the text was attributed, TV 5, has said it was not their report. Chief Insp. Romeo Santander, head of the Cebu City Police Office’s City Intelligence Branch, said some families evacuated from their homes after receiving the message. The police, he added, went to those families, particularly on Urgello St. in Cebu City, to reassure them the message wasn’t true. Santander said these families also saw the message on Facebook, where it was repeatedly shared by those who read it on the fan page of an actress. “This is a time when help should come. Love should be the main consideration, especially for those victims,” said Archbishop Palma. He is also president of the Catholic Bishops Conference of the Philippines. He also clarified that the earthquake was not a form of punishment from God, as some people have been saying. “Some of our churches have crumbled, but we will rise again,” he added. During his visit Monday, Duterte explained that Davao’s assistance for Cebu is P500,000 for each of nine affected local government units (LGUs). Governor Davide and eight of the nine mayors personally thanked Mayor Duterte for the gesture. The nine recipient LGUs are Argao, Dumanjug, Sibonga, Minglanilla, Tabogon, Boljoon and Toledo, Talisay and Mandaue cities. “We wanted to help everybody,” said Duterte. Governor Davide said the Province has sent water and food to Bohol, pending the Provincial Board’s discussion on how much cash to give. On Monday afternoon, Albay officials also visited the governor to hand over donations. Sto. Domingo Mayor Herbie Agua and PB Member Ralph Andes turned over P500,000 to Davide and Vice Gov. Agnes Magpale. Davide, too, warned people against believing the hoax warnings.